Logic is one of the mathematical methods of representing data as well as rules in Machine Learning and Knowledge Discovery. Recently some methods are developed based on algebraic concepts, e.g. closed sets, for the aim. In the converse, Machine Learning procedures are found to provide procedural semantics to algebraic, and logical inference. Registration fee: Free, but joining Banquet costs 6,000 JPY. Abstract: In this talk I will describe a canonical representation for propositional Horn theories known as the Guigues-Duquenne basis (or GD basis), that was introduced in the field of Formal Concept Analysis. I will show strong connections between this representation and two topics in query learning theory. First, I will show that a well-known algorithm by Angluin, Frazier and Pitt that learns Horn CNF always outputs the GD basis independently of the counterexamples it receives; second, and if time permits, I will show how to construct strong polynomial certificates from the GD basis directly. This is joint work with Jos・L. Balc痙ar. Abstract: First we recall some background necessary to understand the definition of the Normalized Information Distance. Then we outline as possibleapproximations the Normalized Compression Distance and the Google Distance. Next, we turn our attention to clustering. Clustering algorithms working with a matrix of pairwise similarities (kernel matrix) for the data are widely known and used, a particularly popular class being spectral clustering algorithms. In contrast, working directly with the pairwise distance matrix has found less attention despite the fact that in many applications distance matrices are often directly given. So, we look at clustering algorithms based on Semidefinite Programming (SDP) based on the work of Frieze and Jerrum and on spectral clustering working over similarity matrices. Finally, we shortly propose a simple heuristic for dealing with missing data, i.e., the case where some of the pairwise distances or similarities are not known. Banquet fee is 6,000 JPY (JPY cash only). - Name, Telephone number, and E-mail address of the corresponding author. 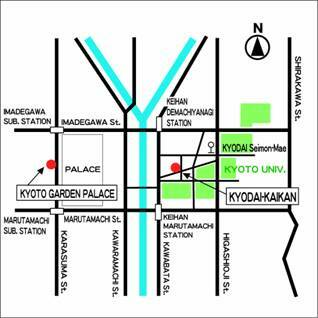 - From Kyoto JR Station, take the bus 206 at terminal D2, stop at the bus stop Kyodai-seimon-mae and walk about 5 mins. - By Keihan train, get off at Keihan Marutamachi Station and walk about 7 mins.